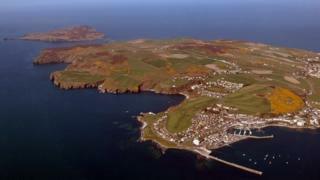 A teenager has been rescued from the Calf of Man after suffering chest pains during a family visit to the island. The 17-year-old, who had recently undergone heart surgery, was taken by lifeboat from the island's south harbour at about 23:00 BST on Thursday. A spokesman for the RNLI volunteer group said the crew had carried out a "perfect rescue" . The boy was taken to Noble's Hospital on the Isle of Man for precautionary checks. In severe weather the remote Calf of Man can be cut off for weeks, with supplies delivered by boat. It is populated by two wardens who receive basic accommodation in a small farmhouse for nine months of the year.